Inspirational Women - My Top Nine! To celebrate International Women’s Day I’m reflecting on the women who most inspire me. I was originally just going to talk about other female bakers, but then when I sat down to write this I realised I’m inspired by amazing women all across the board, so I decided to focus on three (rhyming, naturally!) categories: Bakers, Makers, and Movers/Shakers. Even then it was SO tough to narrow it down; it turns out there are dozens of women inspiring me every day (woop!). So, here are just a few of the awesome ladies who make me feel empowered and encourage me to keep going and keep creating. 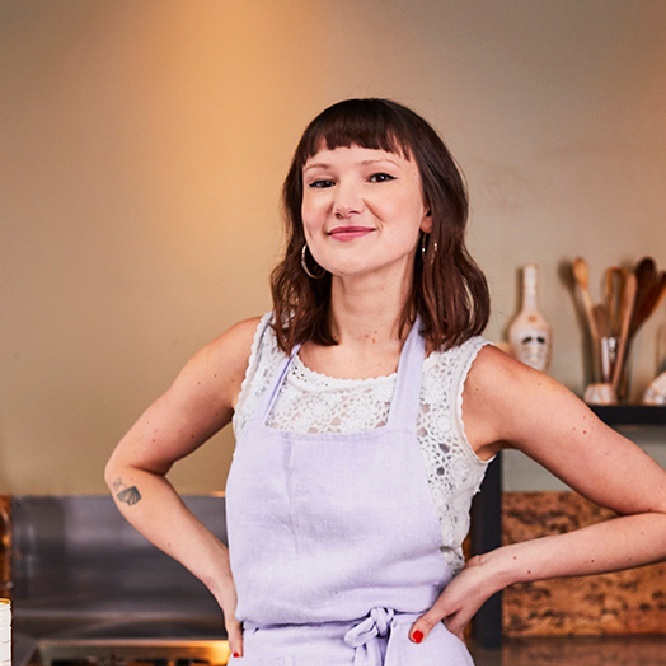 Top of this list for me has to be the ever-awesome Lily Vanilli who makes running a full-time bespoke bakery and a weekly cafe look totally effortless. I’ve always admired her stylish (and always delicious) baking, as well as her approach to business - Lily actively supports others which has led to her being one of the most loved people in this industry. She really helped me when I was starting out and I’m loving watching Vanilli’s go global - she just opened a whole other bakery, in Georgia! Next up is Reshmi Bennett of Anges de Sucre, not just for her world-renowned cake designs (which goes without saying), but also as a source of encouragement and knowledge. I absolutely love Reshmi’s positive approach to business challenges (her responses to requests for freebies are AMAZING!) and I’ve shared her blog post on ‘Copy Cat Cakes’ numerous times as it perfectly captures a really tricky issue, explains it in a way that everyone can understand, and encourages people to prevent Intellectual Property theft in the industry. Reshmi is an absolute force for good! Finally, a massive shout-out to the total goddesses of ‘girl power’, Meringue Girls who are always pushing forwards with their business and have taken the humble meringue to a totally insane level! I have so much respect for them and their amazing team. It’s so encouraging to work in an industry being led by such phenomenal business women. First up in this category is a fellow musician-turned-maker, the inimitable Kat Flint whose insanely intricate lino print artworks went stratospheric last year and she’s finally getting the credit she always deserved. I’ve been an admirer (and proud friend!) of her since the beginning and her beautiful story-filled designs and distinctive style are a constant source of inspiration and joy. Next, the original official Queen Of Biscuits, Nikki McWilliams who not only creates the most sought-after biscuit themed merch in the world, but is also an absolute visionary in the making community. She’s constantly learning and teaching new things and providing endless encouragement to makers everywhere. I finally met Nikki briefly last year when we were both judges on Kirstie’s Handmade Christmas - I can’t wait to see more of her on screen in the future! Finally, in the ‘makers’ category, is Emily Alston - aka Emily Forgot - who I first came across when she spoke at Reasons To a couple of years back. Emily’s work is just incredible and I totally love her eye for colours and materials. I am now full-on obsessed with her wooden architectural assemblages (I have a print of one of my faves in my studio and fantasise about creating biscuit versions of them! ); her new work is a source of constant inspiration and if you ever feel stuck in a creative rut, head over to Muse & Maker where she features endlessly intriguing objects and artworks. This category is for those amazing women juggling multiple endeavours and who are always focused on changing stuff for the better. Super inspirational! Top of this list is one of my favourite women, Genia Mineeva, founder of BEEN London. Aside from being an all-round fab human being, Genia is an absolute inspiration in setting up and running a brand. Having gone back to uni to study sustainability, she discovered a technology that reconstructs leather from waste trimmings (normally destined for landfill) and has gone on to create BEEN, which turns this material into gorgeous bags and accessories all made in London. She’s taken it from a Kickstarter campaign to a fully fledged business in record time and I’m so proud and excited to see what she’ll do next - totally awe-inspiring! Next, another Emily, Emily Coxhead of The Happy Newspaper, which celebrates all the good news from around the world. Her boundless positivity and drive to bring smiles to as many people as possible is a source of constant inspiration and something that is much needed in the world right now! I also admire her openness about running a business (definitely check out her Instagram stories) and the way she incorporates her personality into all aspects of her brand. Last, but by no means least, is Ellie Kime aka The Enthusiast. Ellie is another wonderful beacon of positivity! 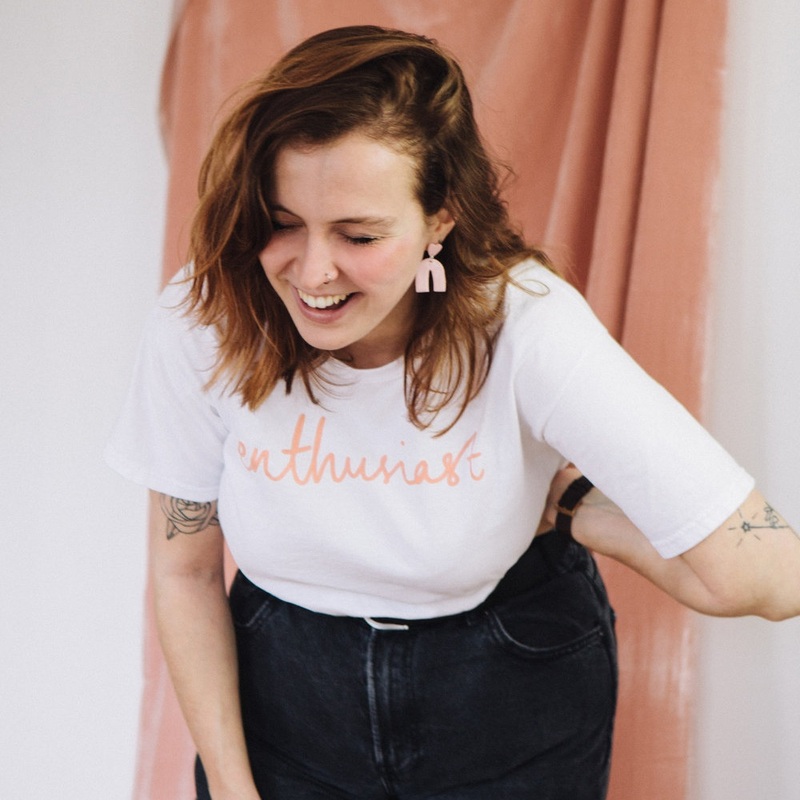 She’s constantly creating new ways of bringing enthusiasm to the masses, spreading the message of “caring is cool” via her excellent T shirts and “Happy To Move For You” badges to help people with invisible disabilities get a seat on the tube, as well as running multiple side hustles including a new podcast for the wedding industry, The Business Proposal. Just awesome. I hope you’ve enjoyed reading all about my Top Nine! I feel totally honoured to be surrounded by so many inspirational women. Happy International Women’s Day! When you’re in the business of gingerbread architecture, your gingerbread has to do more than just taste divine - it has to face many an issue of construction too! That means you need an essential toolkit of all the instruments you rely on to make your gingerbread buildings. If you’ve ever looked in your utensils drawer and thought “What tools do I need to make the perfect gingerbread?” well, pals, this is for you. This week I I’m taking you through my toolkit to show you what each bit is and what it does! Just as Michael Bublé thaws out in November to start cracking out those velvety Christmas tunes we all love, you may think that I only make festive gingerbread around Christmastime. However, I make gingerbread and biscuity bits ALL year round, and 2018 was my favourite year yet in terms of huge gingerbread buildings, projects, and partnerships! A couple of weeks ago I chatted to you about alternative gingerbread wedding cakes, but that’s not where our wedding wares end - this week I’m going to show you how gingerbread can make the perfect alternative wedding favour too! Just as a dog is for life and not just for Christmas, so is biscuit - and that’s why it makes such a fantastic addition to weddings. Gingerbread is so versatile and so much can be done with it to fit your theme that it’s ideal whether you’re having a winter or summer wedding. ‘Out there’ enough that it’ll totally enthrall guests, but traditional enough that people will want to dive in, it’s the perfect alternative wedding cake idea. I also do biscuit cakes too, if you’re more of a custard cream kind of person (I don’t judge.) Here’s a few of the options as some inspiration for ya, but as everything is handmade by me in East London, you can have essentially whatever you most desire! This recipe is the icing on the cake - or, should I say, the gingerbread. Getting the perfect icing is crucial to all of my bakes and builds, as not only is it how I make all of the bespoke details and patterns in my designs, but it’s also how I stick all of my pieces together! This means I need an icing that’s robust and dependable, but also malleable enough for me to be able to colour it, manipulate it, and perfect tiny finishing touches with it. Too watery, and my builds would fall apart; too thick, and I wouldn’t be able to decorate anything. You may think it’s an impossible balance to strike but it’s actually really easy to make. No secret tricks, no crazy ingredients - just the right ratios and a steady hand! See my recipe below, and watch the video above to watch it in action. The clue is in the title: this gingerbread was born to build. It’s the perfect gingerbread recipe for building sturdy Christmas gingerbread houses, or something slightly bigger. It’s the exact recipe I’ve used for all of my wonderful and wacky projects over the years! It’s also the ideal gingerbread to eat, because I never compromise on flavour. What would be the point on making everything out of gingerbread if it couldn’t be eaten at the end? If you know anything about Maid of Gingerbread, you’ll know two things: 1. I love making gingerbread and 2. I LOVE making gingerbread replicas of real life buildings. It’s one of my favourite bits of my job, taking a brief of a beautiful, awe-inspiring structure and translating it into gingerbread format. I thought it’d be a great idea to take you behind the scenes of the process, and explain just how I take giant designs from brief to bake to build. Hopefully it’ll kickstart some inspiration in you and get you thinking about what I can make you out of gingerbread - if you have any ideas head to the bottom of the blog to find out more about the ordering process! A beautiful wedding styled photoshoot including The Gingerbread Grand Budapest Hotel, featured on Green Wedding Shoes this week. Creating an edible version of this world famous Château and its surrounding gardens using vanilla and matcha green tea biscuits, for The British Museum summer party. Summertime is creeping in so I wanted to share with you some ways to enjoy the summer in all its biscuity goodness. I mentioned last week about how gingerbread isn’t just for Christmas, it’s for all year round. There is a plethora of uses for gingerbread aside from building gingerbread houses and decorating them in snow 'icing' - although, let’s be honest, that’s fun too. Being a gingerbread connoisseur, I love to experiment with what I can make, taking my biscuit building to the next level. I’ve made 3D installations for shop windows and recreated ancient tombs as well as producing replicas of existing buildings in delicious biscuit form. But I always feel like there’s more that can be done with gingerbread. Despite its lack of bendiness it’s actually a really versatile building material and can hold its own in almost any shape you can imagine. So with the summer just around the corner, I wanted to inspire you to get baking no matter the weather outside. So, with that said, here are some ideas to help you celebrate and enjoy biscuity goodness all year-round. Weddings can sometimes be a little bit awkward for guests. If you get sat next to someone you don’t know it can be hard to strike up a conversation or feel comfortable at your table. Group wedding favours can kill two birds with one stone! And if you can make that wedding favour edible you’ll have some very happy guests. A 3D gingerbread table centrepiece will encourage everyone to talk and band together, break into the biscuits and provide a really fun after dinner treat. Try it and see how it brings out the inner child in your guests! It can also save you a lot of money on buying individual wedding favours. If you’re feeling really brave why not try baking your own? Piñatas are great for outdoor summer parties, for adults and kids alike. They are social, fun, silly and great to get people up and active at a party. But a fully edible piñata? You’d be surprised how much more excited people are about getting involved! I created a gingerbread fiesta llama piñata recently, which featured hand-piped royal icing ruffles and was filled to the brim with rainbow sweets. The great thing about edible piñatas is there’s no mess left behind because every element is edible, so you don’t have to worry about clearing up and disposing of lots of rubbish at the end of the day. It might sound like a crazy idea, but stick with me. Gingerbread is perfect for an outdoor summer party. Try baking a tray of gingerbread men, or birds, or triangles for traditional bunting. In fact, it could be anything to match the theme of your party. Just punch a hole in them just before you place them in the oven, decorate them sparingly with royal icing and you’ll have yourself the start of a perfect row of bunting! Thread some ribbon through each piece - make sure it’s thick ribbon to support the weight of the bunting - and hang it up, perhaps in the trees if you’re in a park or around the windows of a gazebo. The best thing is, you can finish your BBQ and turn to the decorations for your dessert. Wedding season is starting - although, of course, people have weddings all year round, we just seem to love the sunshine - and the past few years have seen a rise in people opting for an alternative wedding. They might not want a white dress, or a first dance, or a traditional wedding cake. I’ve had many requests over the years to make alternative wedding cakes. One of my favourites was this recreation of a ruined tomb I made for a couple who were both archaeologists. They both preferred biscuits to cake but still wanted something spectacular to be the centrepiece for their wedding. Gingerbread is a great alternative to a wedding cake because you can make a display of individual pieces or an impressive structure in the shape of almost anything you love. It can be decorated just as much as you can decorate a cake, so it’s guaranteed to look spectacular, and because it's hollow you can include a whole host of delicious surprises inside it too! There’s something about the summer heat that makes us Brits turn alfresco and many of us love to have big celebrations outdoors, whether it’s a birthday, wedding, engagement party or family reunion. A centrepiece at an outdoor party can make it feel special but cakes are not the best items to leave out in the sun for hours. Biscuits, on the other hand, are great. They won’t go soggy or begin to melt, you don’t need to worry about keeping them on ice or in the shade. If you want to bake something really special, try making a vanilla biscuit box filled with your favourite treats and decorated with edible flowers: delicious summery perfection! So here are five ideas for summer biscuits, but there’s so much more you could do! Gingerbread is a great building tool, and it’s possible to build anything you can imagine. What about you? What’s the strangest thing you’ve used gingerbread for and will you be trying anything new with biscuits this summer?